Do you love a little bit of spice with your deviled eggs? 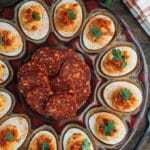 These smoky Chipotle Deviled Eggs with Chorizo are a festive, zesty twist on the classic appetizer. When I want to serve deviled eggs with a little extra zing, I love to turn to chipotle peppers and adobo sauce. These Chipotle Deviled Eggs with Chorizo hit all of the right notes for a zesty appetizer: creamy, smoky, tangy, and as spicy as you want them to be. Not to mention beautiful on a platter–look at those festive colors! Like most deviled eggs, this recipe is a cinch to whip up. My friends and I love them for game watch parties, Cinco de Mayo, and summer gatherings on the patio. 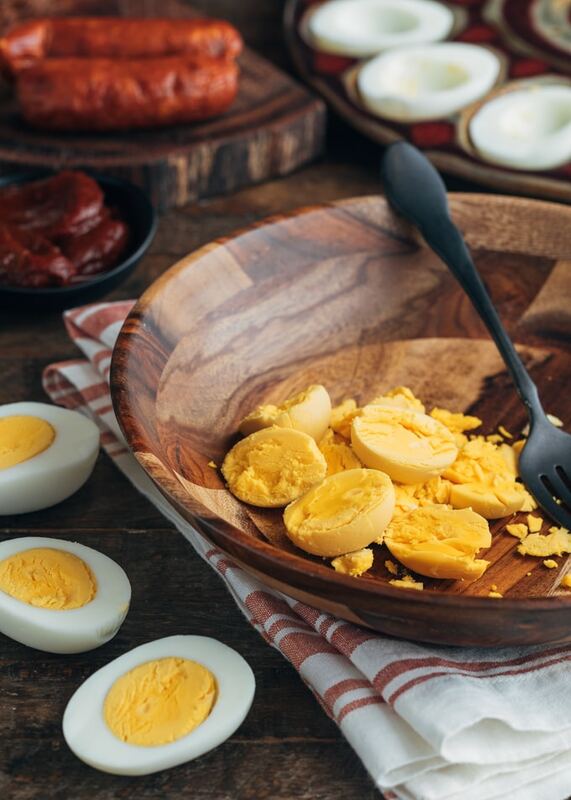 While they’re a two-bite appetizer, Chipotle Deviled Eggs aren’t a dainty bite by any means. Serve them on their own with a glass o’something cold, or add them to your tapas menu for easy, casual entertaining. Want to make an array of deviled eggs for your party? 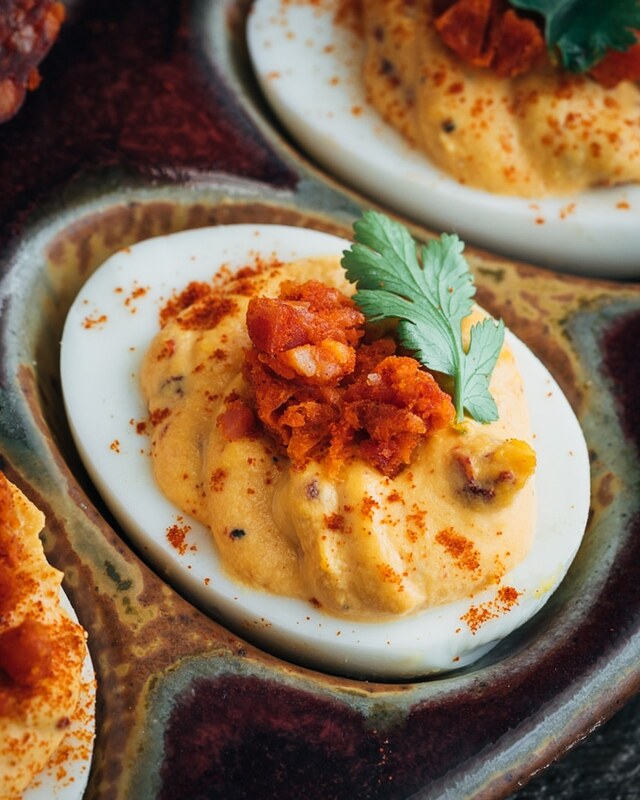 Don’t miss my recipes for Classic Deviled Eggs, Bacon Deviled Eggs with Horseradish, and Italian Deviled Eggs. What is Chipotle in Adobo? Chipotle in adobo (or “Chipotles en adobo”) are chipotle peppers soaked and canned (or jarred) in Mexican adobo sauce. You’ll find it in the ethnic aisle of the regular grocery store, or in Latin specialty markets. Chipotles are smoked, dried jalapeño peppers. You’ll find them whole, ground, or reconstituted for a product like chipotle in adobo. Chipotle peppers known for their moderately hot and smoky flavor, coming in at a range of 3000-1000 units on the Scoville Scale. In Spanish, adobar means “to marinate”. Mexican-style adobo sauce is a marinade containing tomatoes, vinegar, garlic, and spices like cumin. It’s an earthy sauce that’s balanced between sweet, spicy, and smoky. You’ll have extra Chipotle in adobo left over after making these deviled eggs. Need some recipe inspiration to use it up? 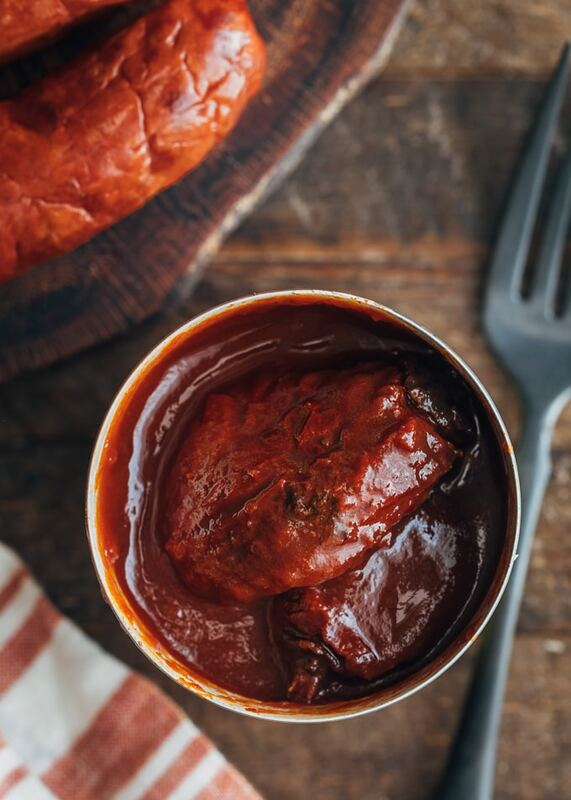 Check out 8 Ways to Use a Can of Chipotles in Adobo Sauce from Bon Appetit. For this filling, I like to use my hand mixer to whip together egg yolks with mayonnaise, Dijon mustard, adobo sauce, and a touch white wine vinegar (champagne vinegar is my favorite). Once it’s smooth and fluffy, I either stir or whisk in minced chipotle peppers by hand, to taste. Before you get started, don’t miss my How to Make Deviled Eggs “Ultimate Guide”. I’ve laid out all of my tips and techniques for making great deviled eggs, every time. Since the filling contains bits of chipotle peppers, this filling works best with a plain star tip on a piping bag, or a zip-top bag with a snipped corner. Once the egg whites are filled, I top them with chorizo for a little extra spice, and cilantro for a fresh finish. Chorizo is pork sausage common to Latin cuisine. It’s known for being spicy, though you can find it in both “mild or sweet” and “hot” versions. In the United States, you’ll most often find the Spanish and Mexican styles of chorizo in the regular grocery store. These chorizo varieties vary both in flavor and preparation. Spanish chorizo is sold as a dried, cured sausage, much like salami or pepperoni. You can slice it and eat it “as is” on a tapas plate or use it in recipes without having to cook it. It’s rich, fatty, and seasoned with garlic and smoked paprika. Look for Spanish chorizo in the deli or charcuterie section of your grocery store, near the salami and pepperoni. Mexican chorizo is most often sold raw and must be cooked prior to eating. This ground sausage’s distinctive flavor and color comes from vinegar and chilies. You’ll find it in the butcher section at the grocery store. What Kind of Chorizo Should I Buy for Chipotle Deviled Eggs? For these deviled eggs, I like to use Spanish chorizo that I’ve minced finely into a texture reminiscent of a crumble. My friends and I like the rich, slightly chewy, salami-like texture against the creamy, smoky egg yolk filling. Hot Spanish chorizo is a great way to cap off the smoky flavors of the chipotle with an extra bite of heat. For a milder bite, look for dried links of sweet Spanish chorizo. Are Chipotle Deviled Eggs Very Spicy? These deviled eggs have a definite smoky quality, but the heat level is up to you, as well as the adobo you’re using. I’ve found that different brands of chipotle in adobo vary in terms of spiciness and tanginess. For these chipotle deviled eggs, where you’re using both the peppers and the sauce, the amount that you use in the egg yolk filling may vary by the brand you’re using. The rich egg yolks and mayonnaise tend to soften the heat a bit, bringing out the peppers’ smoky notes. Still, chipotle peppers can pack a punch, so it’s best to start conservatively with your chili and sauce quantities, adding additional to your spice and tang preferences. Since it’s liquid, adding too much adobo sauce can make the filling too thin. If you find you want a spicier profile in these Chipotle Deviled Eggs than the chiles and sauce provide, you can boost them with a little chili powder (like ancho) in the filling, to taste. The chorizo will also add some heat to the bite. We love the zing of hot Spanish chorizo to cap off the smoky flavors in the chipotle and adobo. For a milder bite, substitute sweet chorizo. Gently scoop yolks in to a bowl and mash with a fork or wire whisk. Add mayonnaise, Dijon, adobo sauce, and vinegar. Whisk until smooth. 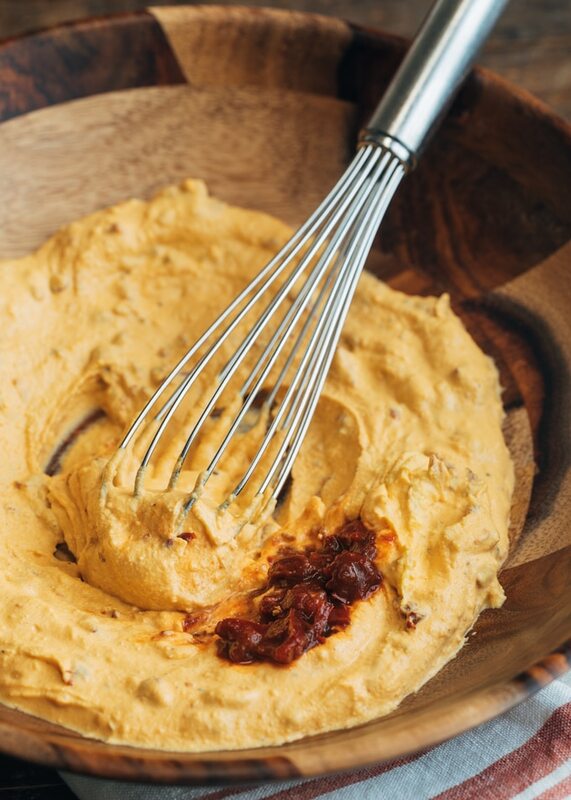 For the smoothest, creamiest filling, use a hand mixer (my preferred method). Stir in chipotle peppers by hand. Season to taste with salt, pepper, and add additional chipotles, adobo, and vinegar, if needed (see note below). Fill each egg white half with some of the yolk mixture, either using a spoon, a pastry bag with a plain piping tip, or a zip-top bag with the corner snipped off. Top each deviled egg with a little chorizo, a cilantro leaf, and lightly dust with paprika. These deviled eggs should be served immediately or up to a few hours of assembling. Store them, covered, in the refrigerator. Don't miss my Ultimate Guide to Deviled Eggs for deviled egg making tips and techniques. The amount of chipotle pepper, adobo sauce, and vinegar you add to these deviled eggs will depend on both your spiciness preferences and the brand of chipotle in adobo you're using. Some brands are hotter than others, and some have more tang to them. Start conservatively and adjust these three ingredients to taste, based on the brands you're using. I most often use 1 teaspoon of adobo sauce, 2-3 teaspoons of minced chipotles, and 1/4 teaspoon of vinegar. Remember that the more adobo sauce you add to the filling, the looser it will become. If you find that the mixture isn't spicy enough for your preferences after adding a full teaspoon, plus the minced chipotles, consider adding a little ancho chili powder instead to retain a pipeable consistency. Don't like cilantro? Garnish with snipped chives or thinly-sliced scallions. An absolutely genius recipe! Whenever I buy a can of chipotle in adobo, half of it always just sits in my fridge and eventually gets tossed. I’m loving this way to use it! Gives deviled eggs a nice little kick. A must try! I love deviled eggs but John not so much. He’s going to love this recipe. I can put the adobo sauce in anything and he’s guaranteed to love it. This is perfect timing for all those extra Easter eggs the bunny leaves behind! Deviled eggs are my favorite appetizer in the whole wide world, so I’m so excited for this smoky and spicy version. I cook a lot with chipotles in adobo, but I’ve never thought to put them in deviled eggs; now I know what to do with those extra ones I have hanging out in the back of my fridge. What a delicious recipe! This recipe makes me so happy. It seems as though deviled eggs have become a lost art. When I was growing up, potlucks were guaranteed to have them! Someone always brought deviled eggs. (And I always ate half the tray.) These days, I never see them. I love the smokey spin on these bad boys. I’m going to be thinking about these gems until I make them. I never make deviled eggs because they just taste so blah..but these are whole different story. I’m thinking they’ll be PERFECT for my cinco de mayo party. A fun little pick up appetizer with tons of flavor. Great idea. Holy moly! 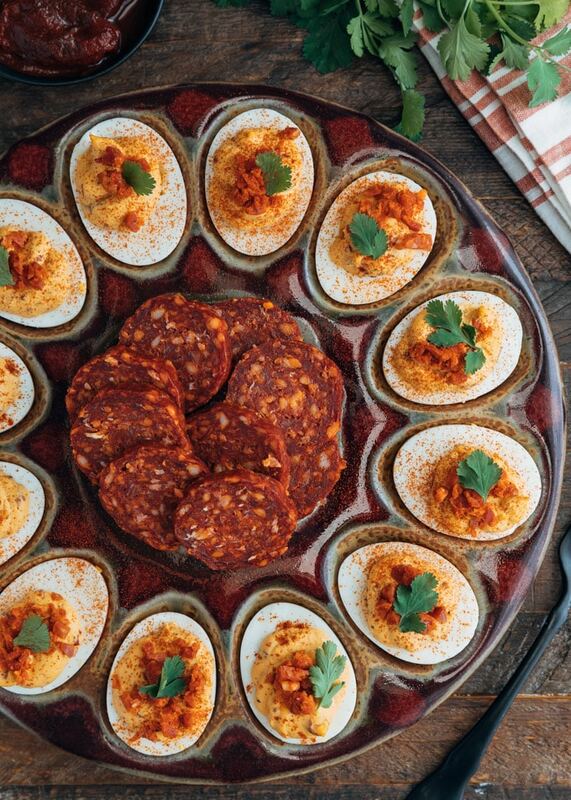 You had me at chipotle deviled eggs, but that chorizo…what a nice surprise! I’m pretty sure these are never going to make it outside of my house before I DEVOUR them…so I can forget about taking them to a party LOL. Srsly…another winner, Amanda. Thanks for sharing! We are a deviled egg household. There’s not a single event that goes by without a plate of them so I am always thrilled to see new recipes! We often make a deviled egg recipe with chorizo on top, but I love that you’ve added adobo to yours as well. You’re totally right about the differences in adobo by the brand as well. A little at first can sometimes be just the ticket and a great excuse to sample some of the filling! These sound perfectly smoky and delicious! Oh I LOVE a deviled egg with a little bit of a kick. This sounds PERFECT for our Easter menu. I’m going to check out your others too for a little deviled egg trio!! These are the deviled eggs I always wanted my mother to make. Spicy, smoky perfection. I love the way you’ve merchandised the eggs with slices of chorizo to nibble outright. Forget about Easter… this is going to be our new appetizer staple for every gathering going forward. This is such a unique combination, I know my family will love it! Thank you, this one’s a keeper! OK…I LOVE LOVE LOVE deviled eggs. Always a hit at parties…and the first appetizer to fly off the tray. I have a friend who LOVES deviled eggs too. That was the hit of his retirement party…I made sure he had LOTS! I know these would be a hit. I will give these a go at our next party! !